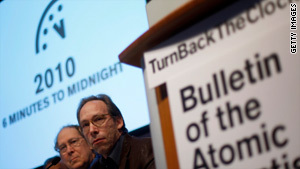 Members of the Bulletin of Atomic Scientists announce the adjustment of the 'Doomsday Clock' in New York on Thursday. (CNN) -- The world has inched further away from doom and nuclear disaster, said a group of respected scientists that includes 19 Nobel Laureates. The symbolic Doomsday Clock has been moved back a minute, reflecting the Bulletin of Atomic Scientists' more optimistic view of the world's chances of avoiding catastrophic threats such as nuclear attacks. The clock is now set at six minutes to midnight, with midnight representing a nuclear apocalypse, according to the group, which is based in Chicago, Illinois. "We are poised to bend the arc of history toward a world free of nuclear weapons. For the first time since atomic bombs were dropped in 1945, leaders of nuclear weapons states are cooperating to vastly reduce their arsenals and secure all nuclear bomb-making material," the scientists said in a statement Thursday. The Doomsday Clock was created in 1947 and had been adjusted only 18 times before Thursday, the group said. The closest it has been to midnight is two minutes, from 1953 to 1960, after the Soviet Union and the United States stepped up testing of thermonuclear devices. The farthest has been 17 minutes, from 1991 to 1995, after the signing of the Strategic Arms Reduction Treaty. "A key to the new era of cooperation is a change in the U.S. government's orientation toward international affairs, brought about in part by the election of [President Barack] Obama," the group said. "With a more pragmatic, problem-solving approach, not only has Obama initiated new arms-reduction talks with Russia, he has started negotiations with Iran to close its nuclear enrichment program, and directed the U.S. government to lead a global effort to secure loose fissile material in four years. "He also presided over the U.N. Security Council last September, where he supported a fissile material cutoff treaty and encouraged all countries to live up to their disarmament and nonproliferation obligations under the Nuclear Nonproliferation Treaty," said the group, which added that much more work needs to be done. Threats remain around the world, the scientists said, noting that governments might not live up to pledges to reduce nuclear arms and combat climate change. Scientists and other experts who had produced the atomic bomb for the Manhattan Project established the group in 1945, its Web site said.